Our working bee attracted other bees. We sowed nearly 2 kgs. of native everlastings flower seeds on our land at the corner of Congdon Street and Railway Street, to beautify the space, pending redevelopment. Unfortunately, when the flowers emerged, so did the weeds. There were at least four different types of grasses, some over 1 metre high. See the video above showing a technique taught by Lesley Shaw, BSc Conservation Biology, an experienced bush regeneration volunteer. 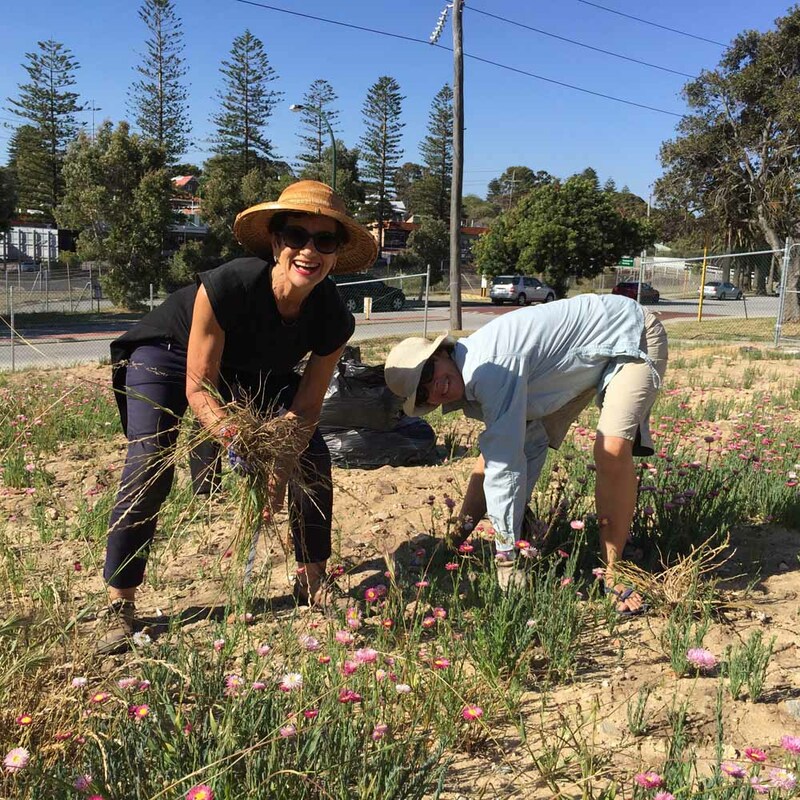 We were happy to learn how to quickly remove weeds from sandy soil at a working bee weekend recently. In a few hours we were able to remove most of the grass weeds using a breadknife. Cutting below the rootball left the lower part of the weeds' roots in the soil, which keeps the sand stable. Lesley explained that the weeds don't re-grow from the lower part of the root. The pink-headed everlastings remained safely upright in the sandy soil. Lesley teaches that bushland areas in the metro environment are vital for everyone’s well-being. They are the green lungs of our towns and provide refuge for wildlife - and importantly a cooling effect as our urban areas grow denser. You might be incorporating native flowers into your verge to attract birds and save water. Next time you're removing weeds, think about the breadknife technique. It's fast and easy. Older PostTown Houses in Swanbourne | Should we be Inspired by Melbourne?